As I came to those chapters, I read quickly through the list: The daily offerings, the Sabbath, the New Moon, Passover, Unleavened Bread, Pentecost… Wait, the New Moon? When did they start that? Is that one of Yehovah’s appointed times? Why have I never observed this day? I decided I had to look into this. I immediately turned back to Leviticus 23, which is the first place in the Bible where all Yehovah’s appointed times are spelled out. There was no mention of a celebration on the New Moon. In fact, the first mention of the New Moon celebration is in Numbers 10, where it specifies that the trumpets should be sounded over the offerings, including offerings for the New Moon. The offerings themselves or any other details of the New Moon observance are not mentioned until the list in Numbers 28. On the Hebrew calendar the Bible refers to, each month starts on the night the new moon is visible in the sky, when just the first sliver is showing (called Rosh-Hodesh in Hebrew). So I looked up every scripture I could find referring to the New Moon or the first day of the month. It turns out the Israelites had been celebrating the New Moon from Numbers 10 through Colossians 2, including notable patriarchs such as Moses, David, Elisha, Isaiah, Ezekiel, Hosea, Amos, Ezra, Nehemiah, King Solomon, King Hezekiah and the Jews of Paul’s day. There’s even reference to it as something we’ll be observing in the Millennium (Isaiah 66:23-24). Besides those, I found 20 incidents that took place on New Moons – two in Noah’s ark, the setting up of the tabernacle in the wilderness, Yehovah speaking to Moses and Haggai and repeatedly to Ezekiel, Ezra’s reading of the Torah to the Israelites, the death of Aaron, and the Feast of Trumpets falls on the first day of the month of Tishrei. It seems this is a busy time on Yehovah’s calendar. So how are we to observe it? Unlike some of the other appointed times, there’s no scripture that tells exactly what we are to do or not do on a New Moon. In my research, I found references to sounding the trumpet, bringing offerings, worshipping, dining, and avoiding buying and selling. The offerings are very similar to those commanded for the daily offering, the Feast of Unleavened Bread and Pentecost. Avoiding buying and selling is also commanded on the Sabbath. The Sabbath and The Feast of Tabernacles are also both mentioned as appointed times we’ll be celebrating in the Millennium. The New Moon celebration occurs the same day as the Feast of Trumpets and includes blowing the trumpet over the offering, as do many of the offerings presented for other purposes. Unlike others of Yehovah’s appointed times, the New Moon will never be the same day of the week or the same day year after year. This requires us to note a timeframe on our calendar, but look for the sliver of moon every month. Not having a set day each month (i.e. the third Thursday) or year (i.e. the 5th of June) challenges us to interrupt our normal schedule and break our routine. For planners like me, this is a great gauge as to the priority of my appointments with Yehovah. How easily can I be interrupted by Yehovah? How quickly will I change my schedule for Him? The New Moon is the only appointed time not mentioned in the original list of them in Leviticus 23. I could not find an explanation in the Bible for the omission of the New Moon in Lev. 23. As I thought about the idea of not designating this until later and how it reminds us of many of the other appointed times, I wondered if Yehovah added it as a monthly reminder for us to watch for the other appointed times. However you decide to observe the New Moon, let the spontaneity and the other special times it reminds us of guide you to a meaningful personal expression of thanksgiving to Yehovah for His faithfulness to us from month to month. View a list of this year’s expected dates of new moons and the dates of this year’s Feasts and Festivals. This entry was posted on August 31, 2012 by Administrator. It was filed under Holy Days, Mo'edim, New Moon and was tagged with Feasts, Genesis 1, Lev 23, New Moon Dates, Numbers 10, Numbers 28, Numbers 29, Rosh Hodesh, Rosh-Chodesh. Looking for a congregation in Maryland or people interested in starting one. Some things were lost, changed,or simply ignored in translations, I wish there was more info regarding new moons. Thank u so much for excellent research and imparting it to others.Truly this helps make end time disciples. The Daughter’s of ZION MINISTRIES. Firstly, the prince shall provide the offerings for the feasts and new moons (Ezekiel 45:17). Secondly, the Tree of Life bears its fruit every month (Revelation 22:2). Considering they were picked the month prior, this may be a call to witness of the fruiting. Thirdly, solar and eclipses always happen the day before the new moon (1st day) or the full moon (14th day). If those signs In Heaven imply anything more, like a lunar eclipse falling on the feast days (2014 & 2015), there can only be speculation until it unfolds. Good points, Vort. Thank you for sharing those. It is first mentioned in Exodus 12. It’s actually the first commandment given to the Isreal in Egypt. I see the commandment to start the year with the month of Nisan, but don’t see any reference to the first day of the month or new moon. What verse are you referring to? How did Noah observe a crescent moon during 40 days of rain? There is zero references in Scripture to a crecent moon. But you are sure to find it in the Quran. The Hebrew word for new moon is also new month. Change your new moon in your Scripture to new month and things will look a bit different. 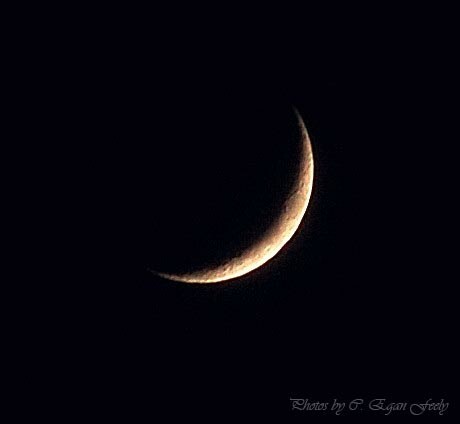 There is nothing new to a crescent, its a moon that has been there a few days. We need to test everything against Scripture and if it is not written, like the crescent, then its not to be followed. We need to remember that He calls these times APPOINTED TIMES because they are appointed to certain days. Too many people follow their own dogma when it comes to the days of Yahuah. Good points, JP. I think the crescent moon is traditionally used because it was a visible indication to anyone watching that a new moon had begun. Do you observe it the day before the crescent is visible? I agree with what you said about the New Moon and the Lord has shown that the Sabbath Day (Seventh Day) is exactly 7 days after we see the New Moon…. Not Friday or Saturday because there was no Friday or Saturday in the Bible. Check out my video at http://www.SavedByTruth.com/sample-page and I have a video detailing this info. We have been honoring the Sabbath Day, the New Moon Celebration and the Feast Days based on the New Moon for 3 years and it is dead right everytime. The Sabbath is not based on the Gregorian calendar since there was none when the bible was written. This is one of the Secrets to the Kingdom of Heaven. The Lord Showed us this 3 years ago and now he is showing it to you. Does your Sabbath change on weekly days? Meaning will it be on Wednesday this year and on Friday next year? I had read somewhere that before Christ people had to watch for the new moon – specifically when it started to crest- imagine that! how joyous they must have been seeing it happen. At least that’s what I think…. we take a lot for granted these days – everything is calculated- technology even though good has somehow replaced the basic things we did. Watching for the new moon to me would strengthen any relationship – I believe that God speaks to us through Creation and by walking in faith towards His instructions we get to know Him more and love Him more…but so too even now He tells us to do things and we must obey and therein lies our true testimony – serving Him in obedience. What about rainy or cloudy nights? Jo, You’re right, it’s not always possible to “observe” the new moon. I have learned that while it is awesome to be able to to, the idea of observing is more in terms of honoring or practicing, i.e. observing the Sabbath. Actually looking at the moon is not all there is to the new moon observance. You can do the rest of it as YHVH leads you.